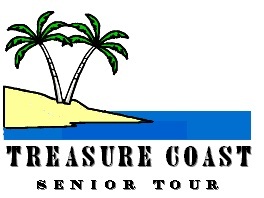 Owned and operated by Roger Kennedy and Jerry Tucker, we are a mini-tour in our 15th season for senior golfers who are over 50 years old (women over 45). Both professionals and amateurs are eligible, but amateurs should have a handicap of five or less. We use varying formats, but most events have an individual purse and a team purse. In the summer events, the entry is usually $150, which includes cart/course fees, range balls and skins. Winter events are $175 to $275, due to increased course fees, team format, etc. Annual Dues are $125.00. Single event dues are $25.00. Winter dues are $50. In the summer events, just text (772-708-1193) or call (772) 288-3234 or email ( to enter. We make the pairings in most events. Generally, pairings are made two days ahead of the event. low entry fees - great golf courses!